Toshiba has announced the dynaPad, a Surface-style tablet with stylus which the company claims is so thin and light that it will effectively "reinvent pen and paper". And there's no arguing with the fact that this is a very svelte sounding device, and much thinner than Microsoft's tablet at 6.9mm (the Surface 3 is 8.7mm thick), weighing 569 grams. Toshiba says it's the thinnest and lightest 12-inch Windows 10 tablet in the world. The same size as a B5 notebook, the dynaPad boasts a WACOM Active Electro-Static stylus and apparently replicates the feeling of natural handwriting with considerable accuracy, with 2048 levels of pressure sensed whether you're jotting or sketching on your tablet. Palm-rest rejection tech is also incorporated with the 1920 x 1280 resolution display to avoid accidental hand presses around the edges of the screen causing mistakes. Toshiba has thrown a load of note-taking and related apps into the mix, including TruNote, TruCapture, TruRecorder, TruNote Clip and TruNote Share. These can be used for scribbling notes, snapping an image of some text, or making a voice recording and so on. Of course, the dynaPad has a keyboard attachment to turn it into a laptop, and this is lightweight as well, featuring a satin gold carbon body. It connects to the tablet using magnets, and Toshiba claims the keyboard sports a strong chassis with a comfortable typing experience. When not being used, the keyboard also attaches magnetically to provide protection for the slate when you're out and about. 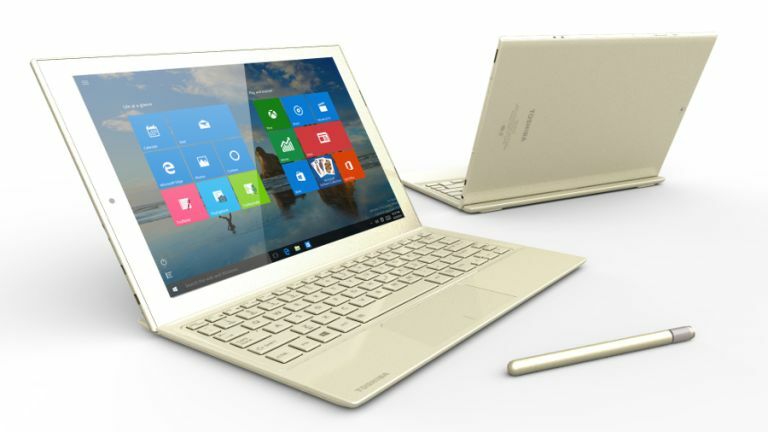 The Toshiba dynaPad is set to be released in the first quarter of 2016, with pricing yet to be confirmed.